Former Cannon County softball standout Kenzie Patterson recently had her jersey retired. The jersey was presented to school officials Oct. 8. On hand for the ceremony were, from left, CCHS Softball Coach Matt Cagle, CCHS Athletics Director Michael Dodgen, Kenzie Patterson, Roger Patterson, Kay Patterson and CCHS Principal Tim Knox. Kenzie Patterson made her mark on Cannon County softball and throughout District 8-AA during a decorated and stellar four-year career regarded as the best in program history. 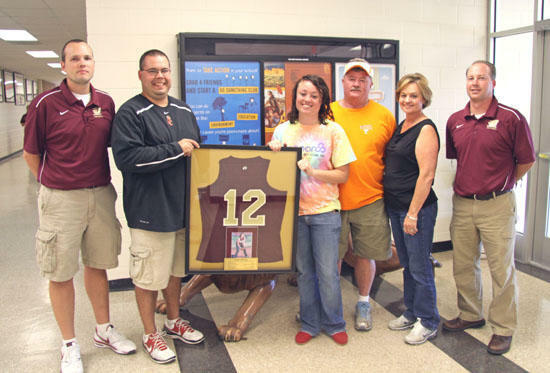 School officials assured her contributions will be remembered when they retired her #12 jersey. It was presented to the school during a recent ceremony. Patterson is the first Cannon County softball player to have her jersey retired and the first athlete to be so honored since basketball standout Julie Powell's jersey was retired following the 1988-89 season. "It is an honor and it makes me very proud," Patterson said. "I'm glad I was able to make my mark here. We had some good teams and good times. I just always tried to give my best." It was an effort that enabled Patterson to become the best all-around player in program history from a statistical standpoint. She was a four-time first-team All-District 8-AA selection. She was named District 8-AA Player of the Year as a sophomore and freshman and she became the first player in Cannon County softball history to be named first-team All-State. "(Patterson) is probably the best to come through so far," Cannon County Head Softball Coach Matt Cagle said. "She was a vital part of the success we have had. She definitely left her mark. She is one of the most competitive people I know and it was a pleasure to coach her." Patterson is the school's all-time leader in home runs (22), RBIs (105), batting average (.368) and stolen bases (22). She was named The Daily News Journal MVP for softball. She hit 14 home runs and drove in 49, while hitting .585, during the 2008 season when she was named DNJ Area MVP, District 8-AA Player of the Year and first-team All-State. "(Patterson) is the leader in every statistical category," Cagle said. "You have to recognize her achievements and what she meant to our program." Congrats, kenzie. I no u worked hard for many years.